SINGAPORE - Switching to a job that comes with a hefty pay cut is hardly a thing most people would consider today, especially in a world where money talks. But that was exactly what two women did, in the spirit of giving back to society. Ms Lam Moi Kwai and Ms Jane Prior, who shed their high-flying corporate careers to move into non-profit social organisations, spoke to MyPaper in the run-up to International Women's Day, which happens tomorrow. 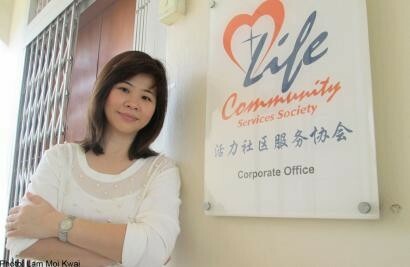 For 42-year-old Ms Lam, director of Life Community Services Society, an organisation that works with children from lower-income families whose parents are incarcerated, making the decision six months ago was far from easy. "I was at the peak of my career, and I was perfectly comfortable (financially)," said the mother of three, who was formerly a regional director at multinational corporation Koni. She currently takes home a salary less than three quarters of her previous one. Still, Ms Lam said she does not regret the move, citing several cases that cemented her belief that it was "the right thing to do". One was that of a 12-year-old girl who did not give in to despair, even after witnessing her father hang himself when she was seven. "Just letting the children know that the larger community is there for them to fall back on, and knowing that what we do is going to make a difference in their lives - that gives me a lot of satisfaction." For Ms Prior, who is in her early 40s, her choice to head the Bone Marrow Donor Programme (BMDP) had an even more personal dimension. Her eldest son, Daniel was diagnosed with an acute type of leukaemia back in 1996 and had to undergo difficult and often painful treatments leading up to his transplant surgery. "It wasn't a difficult decision at all, on top of the support I had from my friends and family, who all knew that this was something very important to me," said Ms Prior, whose organisation builds and manages Singapore's only register of volunteer donors. More than a year ago, she had been managing a self-founded regional marketing and public relations consultancy firm, bringing home a pay packet that was more than double of what she gets today. "Whatever happens in the course of the day, I know that lives literally depend on me and the amazing team at BMDP," she added. "And what could be better than saving a life?"